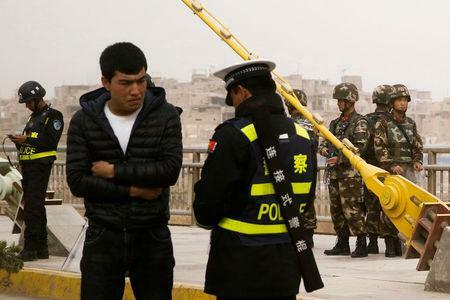 BEIJING (Reuters) - Vocational training is being used "to the greatest extent" in China's far-western Xinjiang region to ensure militant activities are "eliminated before they occur," a senior Communist Party official said. The state media interview with Shohrat Zakir, the number two party official and most senior ethnic Uighur in Xinjiang, is China's most detailed defense yet of its policies in the region, which is home to a large Muslim population. Trainees signed "education agreements" to receive "concentrated training" and undergo "live-in study", Zakir said. "Through vocational training, most trainees have been able to reflect on their mistakes and see clearly the essence and harm of terrorism and religious extremism," Zakir was quoted as saying. "They have also been able to better tell right from wrong and resist the infiltration of extremist thought," he said. "If I hadn't been learning here I can't bear to imagine the consequences. I may have continued to follow those religious extremists onto a path of crime," one young female student told the program. The interview with Zakir comes a week after Xinjiang inserted into its anti-extremism regulations new clauses that prescribe the use of "vocational training centers" to "educate and transform" people influenced by extremism. "International criticism is clearly biting and China's decided to get out in front of the story," he said.